Do you like life hacks and keyboard shortcuts? How about saving time on your social media tasks; do you like that? I do! Anything to make my life easier. As much as I like saving time and being efficient, I despise wasting time and being unproductive. I often have these ’20 minute’ gaps in between appointments, exercising and phone calls and while managing both a business and a busy household. 20 Minutes is too short to get busy on a large project/social media task yet too long to waste – getting into a lengthy project or task isn’t always an option, especially when those larger projects require concentration and uninterrupted time periods. I used to find myself at a loss as to what to do when I had 10, 15 or even 20 minutes to spare during my workday. I used to find these ‘in between periods’ to be unproductive. I would end up surfing Facebook and reading *gasp* for pleasure! That is until I analysed some of my daily, weekly and monthly social media tasks. I also quickly realized that these ‘forgotten minutes’ added up fast! Sometimes I would find myself driving to a client 20 minutes away and wished I could schedule my posts for the week while driving. Or I would think of the potential client I’d been wanting to connect with but I wouldn’t have their contact information on me or in my phone. 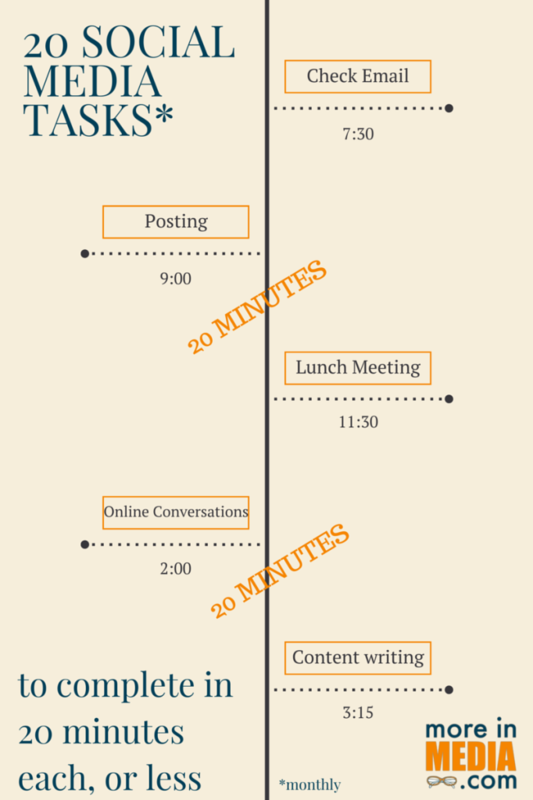 First I wrote 10 WEEKLY SOCIAL MEDIA TASKS YOU CAN COMPLETE IN 10 MINUTES EACH for this blog and then 20/20 Tasks: Smartphone Productivity While You Wait for the Atlantic Webworks blog. Today, I will be sharing 20 additional social media tasks. This time, I’ve selected monthly social media tasks to get done in 20 minutes, or less, each month. Create several quote images to use this month, keeping to the same theme as your videos. Record your social stats in a spreadsheet and note your successes as well as your failures. Create an editorial calendar for the next month to include all your platforms as well as your blogging and email campaign schedule. Do a quick bio audit on your social media profiles. Pick up the phone and call a few past or current clients. Ask them what you can do for them. Write 2-3 LinkedIn recommendations for people who have reached out and helped you this past month. Create a secret board with pins that fit with next months’ theme! Outline your next email marketing campaign and jot down some notes on what to include in the next newsletter. Schedule some of your older blog posts in your Buffer or Hootsuite account. Write the titles and outlines of this months’ blog posts in one document. Add links to relevant articles in this document if you have them. Check out several new tools, apps or websites you’ve heard about and spend several minutes reading more about them and familiarizing yourself with them. Connect with your freelance help (copywriters, graphic artists, web designer, PR agency etc) and make sure they have what they need for the next month in order to stay productive. My wish is for you to read my task list and from here, develop your very own task list to learn how to fit in these smaller tasks during your down time, your waiting time, your travel time to be more productive in your work day!